I've reviewed many books over the past two years on this blog and this book, by far, is the most well written and needed book in our society of all the books that I've reviewed. 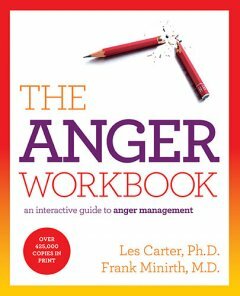 I received The Anger Workbook: an interactive guide to anger management, by Les Carter and Frank Minirth in e-book from and was able to enjoy it on my Nook Color. I have to admit, I was hesitant at first in reviewing this, I mean, is this going to be some hedonistic, worldly approach in dealing with anger? Chock full of philosophical solutions leaving God in the sidelines? Well, this book certainly did not leave God out of the picture, in fact, there was a point where the author clearly stated that having a regular devotional time with the Lord helps to reduce agitation during the day that can lead to anger. Also, before delving deep into the areas that might cause or harbour anger, the author makes sure that the reader understands God's love for them and that their worth and security found in God can too, reduce your need for excessive dependencies which can lead you towards an angry lifestyle. You may be reading this post and wonder if some of your ongoing struggles may be anger related. The authors remind us that there are several ways that people deal with anger, not just with open aggression like slamming doors, yelling and screaming. Giving people the silent treatment or suppressing your feelings is just as dangerous as being vocal and violent with your anger. I recommend this book to anyone who may feel lost in their attempts to overcome anger. This books addresses issues that I would never imagine would be associated with anger such as fear, pride and indulging in unhealthy addictive behaviors. This workbook shares many stories of people who have struggled with anger management and allows for the reader to evaluate where they are and how they can change. The book is full of Scripture, sound advice and encouragement! I highly recommend this book to Christian councilors pastors and parents alike. There is even a chapter on managing a child anger with some excellent, practical advice! I received a copy of this e-book from booksneeze.com for the purpose of this review, all opinions stated are my own, I did not receive monetary compensation.